If there’s one name everyone in travel blogging knows, it’s Nomadic Matt’s. Matthew N Kepnes, the man behind Nomadic Matt, started blogging in 2008 and has since then grown his website into a full-fledged business that doesn’t only provide travel tips, but also has its own forum, sells books and runs tours. He’s become so successful that he has a proper team of 10 people that help him out. As said, Matt also has his own media school which – at the time of writing – offers four different courses. There’s a photography course, a writing course, a videography course and The Business of Travel Blogging Course. That last course is put together by Matt himself, for the other, Matt worked with experts in the fields of travel photography, travel writing and videography. Superstar Blogging is that look. But enough with the intro. Let’s see what his course has to offer. These 28 lessons are divided over 12 weeks, you have your blog set up with a plan on where to take it and how to get there. The lessons primarily consist of text with screenshots, but also have video (especially to show how to set up your site), written-out case studies, audio interviews and recommended reading lists. Every lesson ends with one or more assignments to make sure you make progress as you move through the course. Matt’s lessons are full of information and you’ll need to read some a couple of times to really get all the juice out of them. When it comes to technical aspects, like getting hosting and installing plugins, you can simply follow the video instructions and have everything done at the end of the lesson. Other lessons contain much more information than it looks like they do on first sight (or so I found) and while they tell you the “how”, they don’t show it as much. For example, when talking about Instagram, the course tells you what makes a great Instagram account visually and shows you examples of some, but you’ll have to tie the dots and analyze how each of those accounts showcases the key elements talked about. It’s a bit harder than having it all laid out for you, but it does make you think about how you can apply things to your own brand more. I think that’s the biggest strength of Matt’s course. Besides going over “do this like that”, Matt constantly throws in anecdotes of how he handled certain situations and why his tactics worked. When you get to a point like that in the course it’s important to stop for a minute and imagine how you could get in that same situation or how you could apply the anecdote to your own blog. He also goes into why he thinks you should follow a certain route and not the other and explains the consequences of both. I think this is really valuable because it forces you to think about how you want to build your blog as you’re turning it into a proper business. Make notes, write down ideas and come back to these lessons even after you’ve finished the course. I went through the course two times to write this post, with a few months in between, and I noticed that there still were many things I should take (better) action on. This brings me to something I did miss in this course, and that was some kind of conclusion or “what to do next”. The last lesson is “How to work with tourism boards” and after that, there’s no guidance on how to best proceed now that you’ve gone through the course or how you can keep using it as you grow your blog. Matt does explain how best to use this course when you start it, but a closing note like that would make me (and I think other’s as well) more confident in applying everything I’ve just learned. It’s a bit confusing as both this list and the expert interviews are part of week 1’s lesson material, so if you want to come back to them, you need to remember they’re part of week one and not on a separate page like the webinars are. I love the recommended reading list because it’s full of books on marketing and entrepreneurship in general. That’s good because the people behind them know what they’re talking about on all levels, they don’t just focus on what works in travel blogging or even in blogging so that you can learn to look at your own business field with a much more diversified and broader perspective. The same goes for the expert interviews. Matt doesn’t talk with travel bloggers who do well with SEO or affiliate marketing, he talks with the top players in their fields regardless of blog niche. The only thing I regret a bit is that these interviews were done when Matt launched his course, which means that they don’t really talk about the current state of things. For some things, like copywriting, that isn’t such a big deal, but for something like SEO it would be nice to hear Rand’s (yes, theRand Fishkin of Moz) perspective on SEO now. I think the reason why Matt has left these interviews alone is that they’re all with people who, like I said, are at the total top of their game and so I’m sure it’s not that easy to ask them for a second interview. A good way to solve this could be to have a few other experts talk about the same topics but really with a focus on the state of things now. The webinars tackle specific aspects of blogging, like building your newsletter and growing your audience. Members can follow them live or read the transcript/see the video/listen to the audio recording afterward. All webinars stay up on the course platform, so there’s no need to worry if you can’t attend them live. However, sometimes Matt does his webinars in the form of a Q&A and then it’s always good when you can be there to ask him questions. I’m pretty old school in that I much prefer to read information than to listen to it. So for me it’s definitely a plus that there are transcripts of the webinars as I never attend them live (Sorry, Matt :-)). The webinars don’t really bring on new topics but go more into detail into topics that are also addressed in the course. They elaborate on them or look at them from different angles. For me they are most valuable when Matt addresses something a specific member is struggling with and then breaks that down and helps them (and us) think about their problem in a different way to eventually come to a solution. I list interviews separately here, but actually, the interviews Matt does with other travel bloggers go up on the blog, alongside general articles on how to run a travel blog and weekly round-ups with interesting reads found elsewhere on the web. The weekly roundups are great if you don’t want to subscribe to a ton of newsletters as Matt gives you the best articles he read that week on the business of blogging. They are the most frequently published posts on the blog, alongside the interviews with other travel bloggers. The interviews with other travel bloggers ask them both about their travel experiences, likes and dislikes and about their blogging experiences. The posts about blogging, lastly, tackle anything from being more productive to growing your social media channels. They appear less frequently than the interviews and the round-ups. I love going through the round-ups to see if there’s anything in there about a topic I’m working on at the moment or something that could give me new ideas. The blogging articles always contain good info but they’re often pretty short and don’t go into detail. I think it’s better to check the round-ups to find websites that really focus on specific topics like affiliate marketing and SEO. The interviews, lastly, I find hard to judge. I would prefer if they’d focus solely on how the bloggers run their business as that is, after all, what the course is about, but I can see how other people might find it interesting to also read about their travel experience as we are, after all, also all traveler. The opportunity board allows you to post – indeed – opportunities. It’s used by members and sometimes also brands who post guest post opportunities, press trips, sponsored post opportunities and more. It’s a practical place to keep all opportunities together and it helps to keep the Facebook groups clean. I love the filter feature that lets you look at only the kind of opportunities that you find interesting. The Business of Blogging offers its members discounts on several travel and travel blogging related services like hosting, themes, technical support, plugins, and tours. They’re especially great when you’re just starting out as a lot of the discounts offered here are for services you’ll need to sign up for anyway, like hosting. On top of that, you can also find discounts for some premium plugins here. The Facebook group is the one bit of the course that disappointed me somewhat. I think that partially has to do because the bloggers active in there are mainly true beginners and I’m not anymore. There are little intriguing questions for people who are a bit further down the line, but I guess that’s normal as the course is geared to people who are starting out, so this is more of a personal thing than anything else. I do feel like the group could need a bit more rules in regards to sharing blog posts, asking for website feedback and sharing collaboration opportunities. I know a lot of bloggers love these things, but I find that there are already so many Facebook groups out there that do these things that the Superstar Blogging group would stand out more if it really just focused on questions and advice around the business of blogging. Chris Richardson, the WordPress tech master behind RTWLabs, is also Matt’s tech guy. And he offers free tech support for members of this course. I actually already worked with Chris before I took the course, so I don’t really know how it works when you’re part of the course but I think it’s definitely a bonus that you have someone like him to help you out when something refuses to work. You can join The Business of Blogging for a one-time payment of $267 or three payments of $99. Given the quality and amount of content, the access to Matt and the tech support you get, I think this is a fair price. If you’ve found this review useful and you’d like to sign up for the course, I’d appreciate it if you would use my link. If you do so, I’ll earn a small commission at no extra cost to you. Thanks! Full disclosure: I was given access to Matt’s course for free so that I could review it. He wasn’t guaranteed a positive review. At the moment, Matt’s course it the only one I know of and have taken that focuses purely on travel blogging. Sofie If I want to start a blog on a topic other than travel, should I still buy Matt’s course? 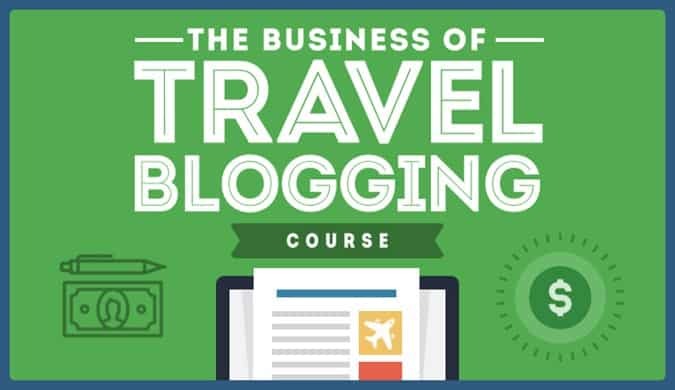 While some of the information and strategies can be applied to all blogging, Matt’s course is specific for travel blogging. If you’re looking to start a blog that you also definitely want to monetize, I recommend Build Blog Freedom. This course teaches you step-by-step how to build a money-making blog. I personally know the lady who created it and now that she absolutely rocks this blogging thing.